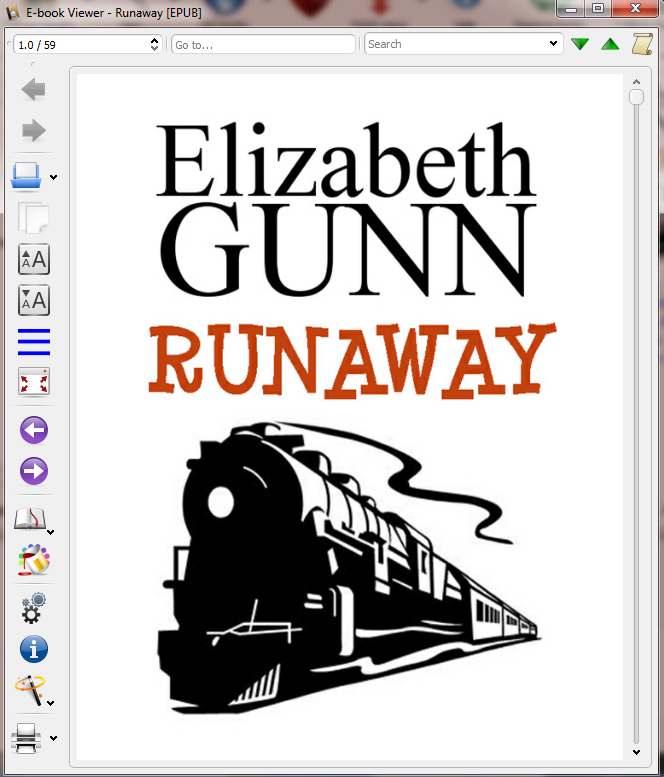 And if there’s no File / Open menu, how do I open my Runaway.docx file? Blergh. Not sure about you but all those choices make me think of the line in the Jimmy Buffet song that goes something like, “I don’t need that much organization in my life”. But I’m not trying to deride the tool here, just help you navigate it. So I’m just going walk through the process for my simple book and lay down a trail breadcrumbs for you to follow. The maze is not nearly as complicated as it looks from the entrance. 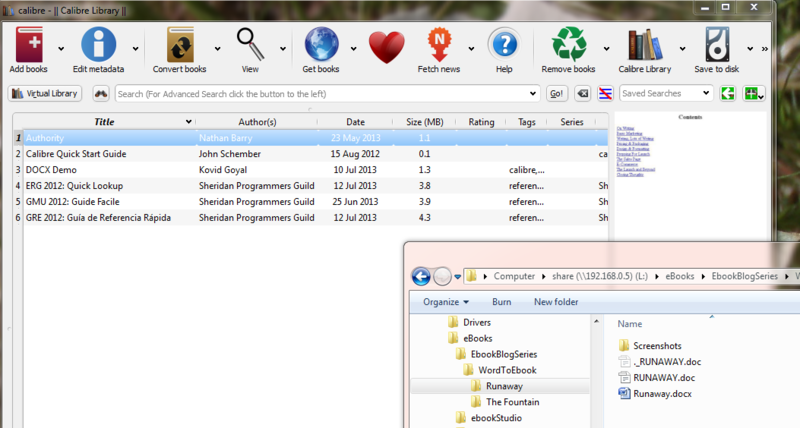 First, to add your .docx to Calibre’s library, just drag the file from Explorer/Finder on to the Calibre window. 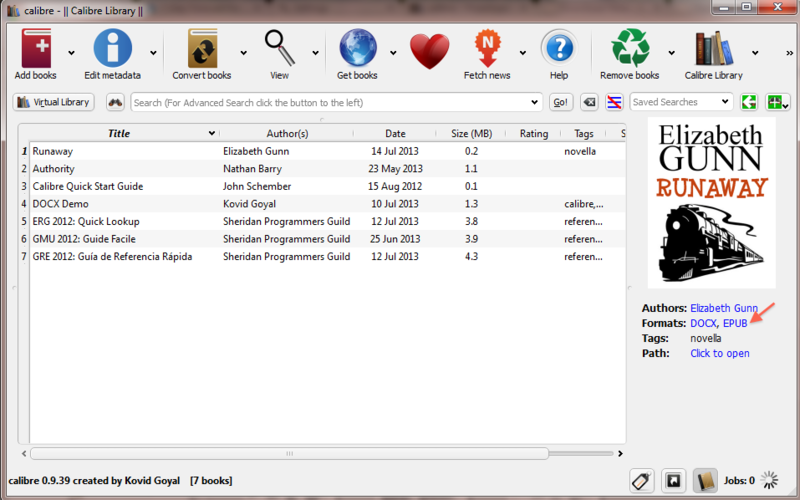 Then click on your new book, in the list, to highlight it and poke that big “Convert books” button. A whole new conversion window opens up. Depending on the way your copy of Word was installed, the Author name may or may not show up for you. If it doesn’t, type it in. 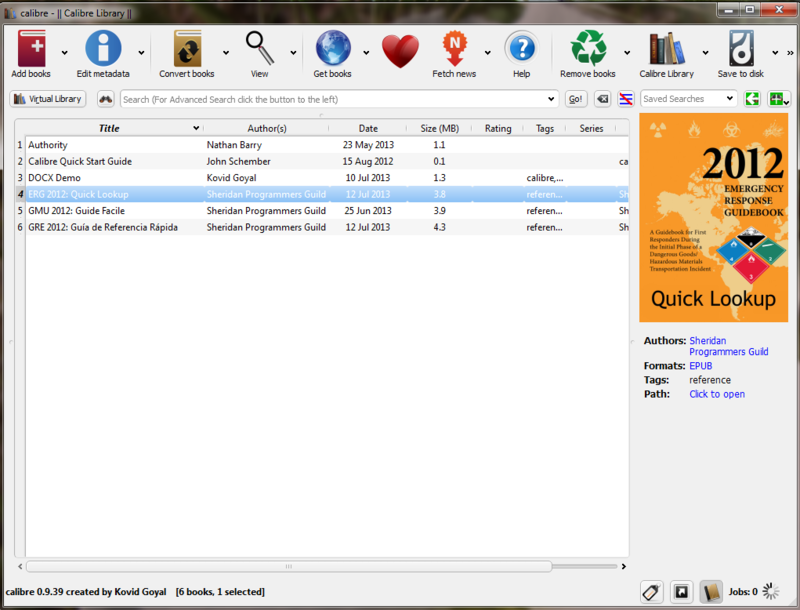 Depending on how Calibre was installed, your default output format (upper right corner) may not be EPUB. If you are playing along with me, in your own install, as you read this, go ahead and change it to EPUB so your options on the left match mine. I typed in my company name as the publisher and added the tag. Both are optional. As is the cover image if you are just trying to see how this process works. But you definitely want a nice book cover before you publish your book in one of the marketplaces. It wouldn’t hurt for you to just click down through the options in the left hand navigation pane and see what’s available for you to try when you need to do something more complex than this small project. The variety can be a bit overwhelming but, as you work with the tool, you will begin to appreciate the power and flexibility that are built into it. To start with, though, the Calibre developers have put a lot of effort into coming up with default values that ‘just work’ much of the time. When you do need to solve a specific problem with one of your output formats, you can just walk back through all these dialogs and, at that point, the correct option is likely to stand out and make sense. The first time I converted my little novella, I just took all the default options. When you are done exploring, just click the OK button. You’ll be returned to the previous window and the conversion process will run “in the background.” (Ebook conversion is actually done by a separate little tool that can be run by itself from the commandline.) You know conversion is running because the Jobs count goes up to 1 and the little wheelie thing spins around for a while. When conversion is done, the result is visually a bit underwhelming. If you look carefully, you can see the epub format is now listed in the book info on the right. 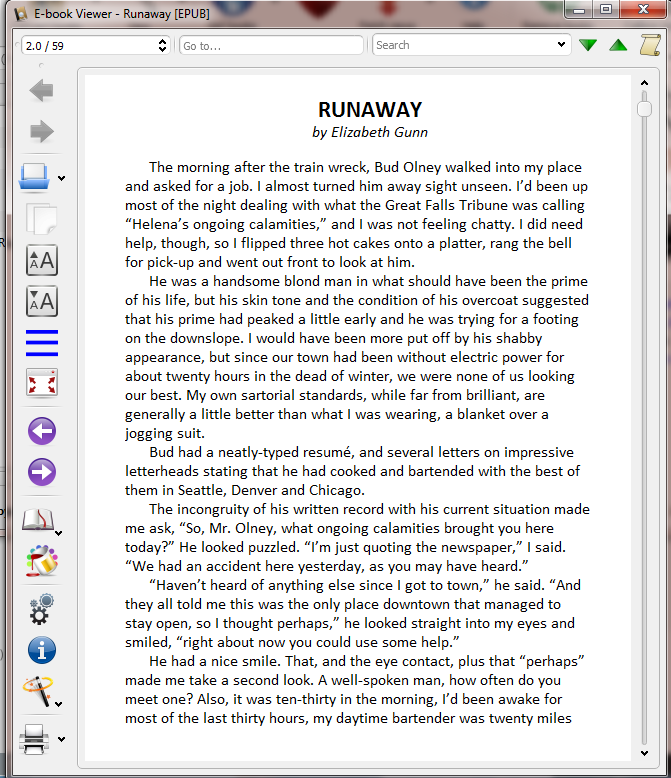 If you double click on that blue EPUB word, your new ebook will open up in a previewer window and you can get a sense of what it will look like on a mobile device. I thought I was going to get spaces between the paragraphs. 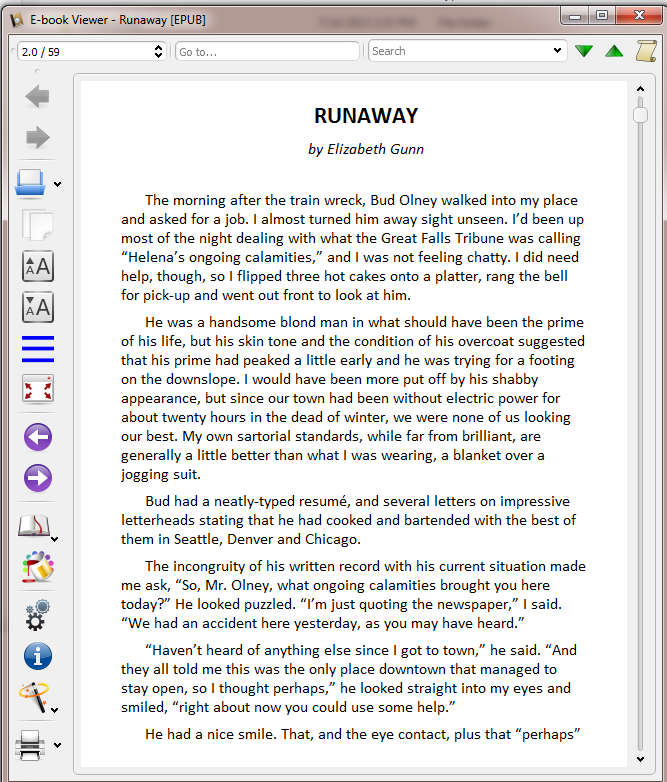 That’s what our original epub-from-html version had. I liked how it looked and I know Mom would prefer it be that way. Hmmm. Let’s check out that Look And Feel dialog; I seem to remember an option to control spacing. Yep, there it is, about half way down. The process is not really all that hard. But when you use the Calibre UI, it IS fairly easy to a small mistake along the way. For our technical books, we actually bypass the user interface entirely and run Calibre’s standalone ebook converter from some tools we wrote for ourselves. That lets us guarantee that we will apply exactly the same options every time we convert. 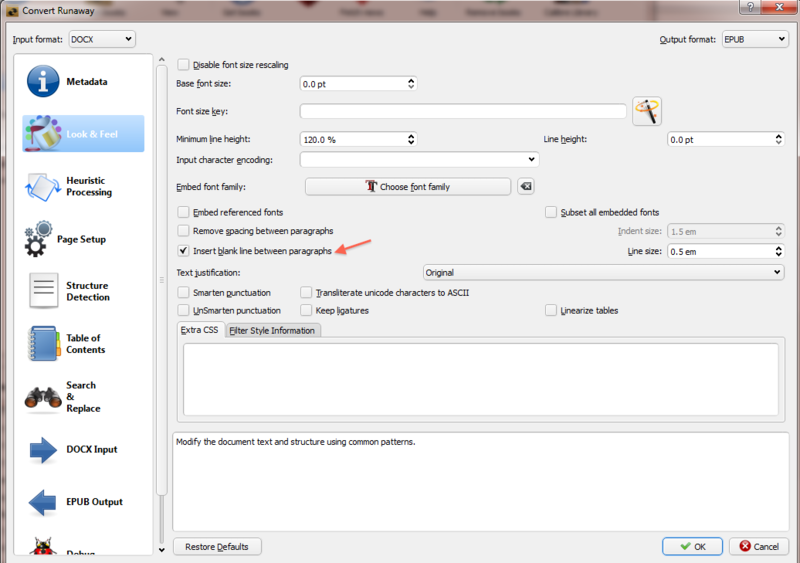 If you are converting relatively straightforward books, fiction or non-fiction, with some chapters and some illustrations, you can probably get by using the Calibre conversion interface and a checklist to be sure you get the options you like every time. But the technical/reference books we’ve been working on for the last few months take innumerable iterations to get all the internal formatting just right. We really can’t afford the time it takes to run the UI or the risk of human error it introduces. 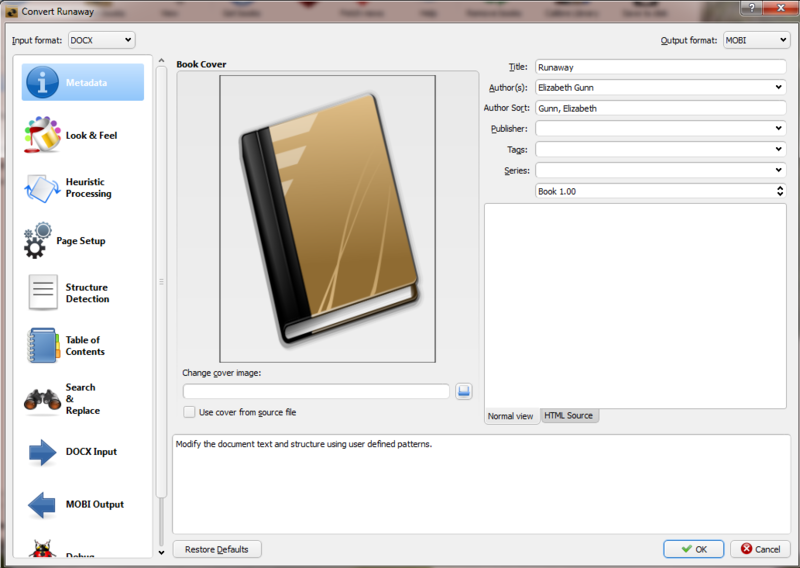 That’s why we automated the actual book conversion step. Do let me know if you have questions or if you think a video demo would help you understand this process. I like scanning text myself, looking for the bits of info I need. But I can create a short video if others would find it helpful. Next up, a very short walk through the iBooks publication process. The Apple publication process is quite different than those of the other marketplaces. 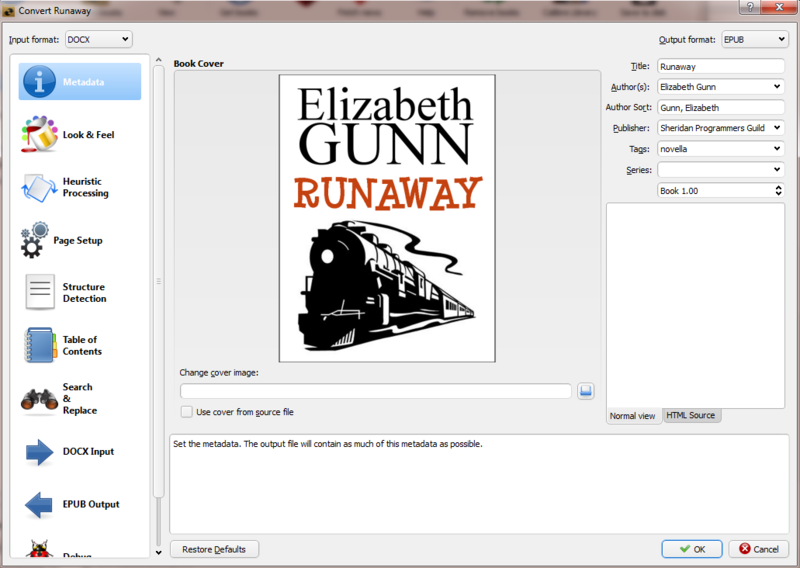 And there’s an odd gotcha, when working with an epub file generated by Calibre. It’s got a simple solution; you just need to know about it.